Fit runner guides for the card racks. The original Sync II had no runners and shorter racks. 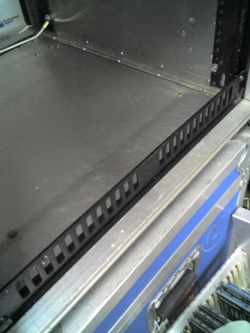 The runners now accept the replacement new-style 25-way CPU rack. 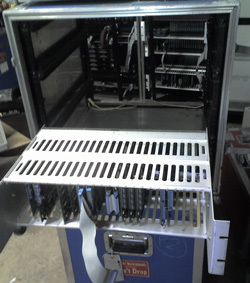 This accepts more cards than the original rack and allows us to upgrade to the latest processor and software. Step 9. 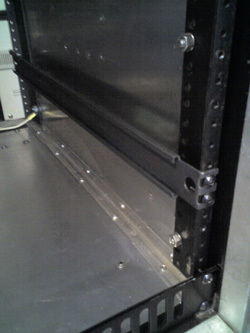 The later style FM bin is slid in on its runners above the CPU rack This bin allows us to upgrade the system to the later FM stereo system should we wish to. It also works with the original mono FM. 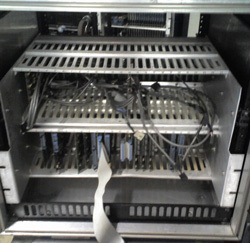 A rear view of the two main racks showing the massive DC power cables. 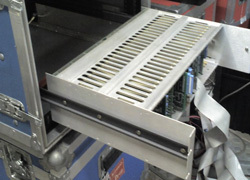 Synclaviers are built to very high specification and fully spec'd can require substantial power. The Synclavier philosophy is over-rate everything so that nothing is strained. The discolouring of the rear is a normal production side effect and is not a result of wear or repair. 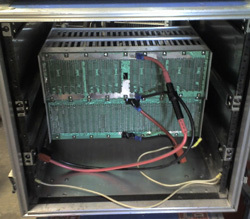 The next stage is to supply some power to the system for initial testing and diagnostics. We will update the pictures daily until the upgrade is complete. ©Copyright 2005 The page, its contents and pictures are copyrighted by Synclavier Europe. Do not use any part of this page without express permission from Synclavier European Services. a whole new experience.